Mt. Adi Kailash is commonly known as Chhota-Kailash. It is sited in Indian Territory, very close to the India-Tibet boundary. Mt. Adi Kailash is commonly known as Chhota-Kailash. It is sited in Indian Territory, very close to the India-Tibet boundary. This area is a place of great natural attractiveness, peacefulness and sovereignty. This area is a spot of great natural loveliness, peacefulness and sovereignty. Those tired of the never-ending roar of urban life, will find this spot to be a religiously healing tranquility. Visit India for Adi Kailash Yatra and get a familiarity of a lifetime. Best time to visit Adi Kailash is July to September. Adi Kailash tour will usually start and end at Tawaghat, a place well-liked for being the confluence of the river Kali and Dhauli in district Pithoragarh. 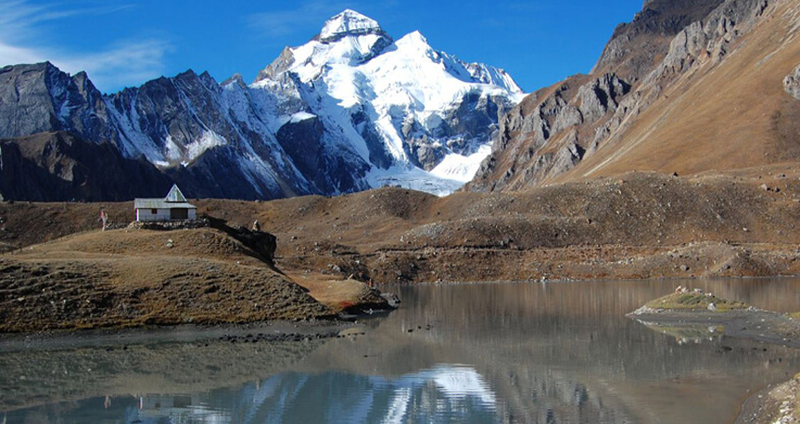 Throughout Adi Kailash tour in Kumaun Himalayas, you will encounter the mighty majesty of the snow capped peaks of Annapurna, the gushing Kali River, number of waterfalls, thick forests, Narayan Ashram full of wild flowers and uncommon variation of fruit gardens. 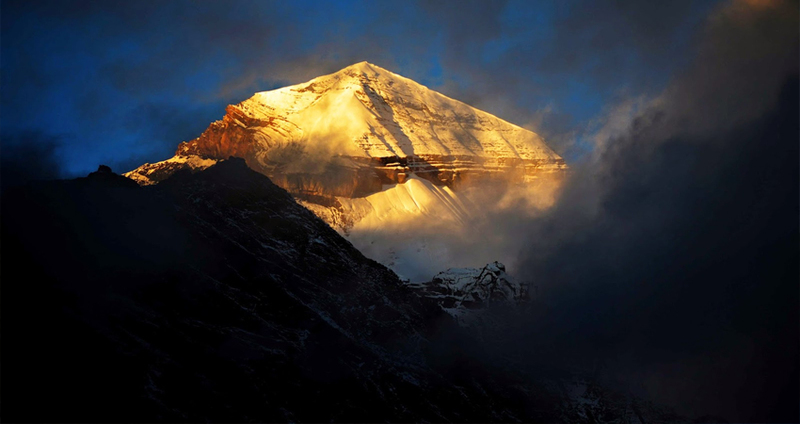 The well-known Om Parvat, a wonder of nature, is clearly noticeable at a distance from here. Snow lies on this Om Parvat in the form of a perpetual "OM", the primordial echo of Hindu prayers. At the foot of mountain Kailash is positioned Gauri Kund, whose water is a sign of the loveliness of the mountain itself. One more water body close by is called Parvati Sarovar. Also known as 'Mansarovar' this place houses a temple devoted to Lord Shiva and Goddess Parvati that you have to visit for religious solace. Adi Kailash has a village named 'Kunti'. This village has been named after the mother of Pandavas, characters from the great heroic Mahabharata. It is a universal faith that the renowned sage, Ved Vyas who wrote Mahabharata lived here for a lengthy time. The locals living in Adi Kailash are known as Bhotias. The Bhotias have potted their family heritage throughout all these years and are for all time ready to platform glimpses of their tradition through dance and music shows. You will simply love interacting with these people and hear interesting stories of their land. On your entrance at New Delhi our representatives will meet you and transfer you to the hotel. After sunset we will drive you to the railway station to get on the train. Overnight in train. Sunup you will enter Kathgodam and from here you will be driven to the Kausani. On entrance, check into the hotel. Relax and night stay at the hotel. Daybreak after an energetic breakfast we drive you to Darchula which is a good-looking village situated in the right bank of Kali River. On entrance, check into the hotel. Dinner and overnight stay at the hotel. Begin your daytime with a tasty breakfast. After breakfast we drive you to Tawaghat. From here you can begin your trekking. You will be delighted to cross the wooden bridge over roaring, foaming river. On your way you can stop for a cup of tea. Get pleasure from the vision of Khela and the magical nearby. Finally you will trek you way to Pangu. On entrance book your stay at one of the hotel. Dinner and overnight stay at the hotel. Begin your day once again. On this day we take you to Juyntigad which is 2 kms on the descent. From here once more trek up to Sosa village (2440 m). On your way you can visit the Tithaldhuraor Tihalakot, Dharma Dvara and a variety of camping grounds. From here you will be taken to Sirkha. Here you can get pleasure from the beautiful P.W.D. Inspection House, a small Bhotiya village, few shops and a Panchayat Ghar. On entrance book your stay at one of the hotel in Sirkha. Dinner and overnight stay at the hotel. Post a delicious breakfast we take you to Samuri/Samre which is 2 km down. You can indulge in visiting the few shops existing there. 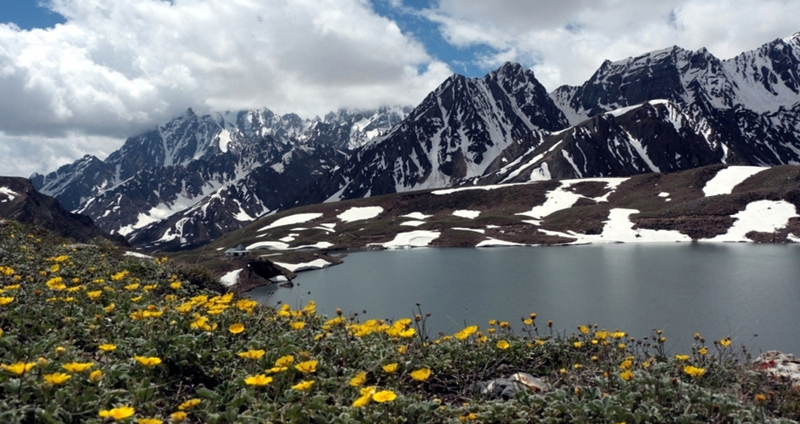 From Samuri you can trek along a steep stony ascent during thick forest to Rungling or Sumariya - Dhar (3048 m). You will also come across the stream Simkhola - gad. From here you will be taken to the village Galla, Bindakoti and finally to Jipti. Here you can once more vision the Kali River. On entrance, check into the hotel. Dinner and overnight say at the hotel. Begin your day with a yummy breakfast. Post breakfast we will take you to Garbyang. The steep descent to the River Kali is an exciting experience. While walking along the River you can also take up Chhatta which is a harder trek. While on your way you will be bewildered by the vision of the pure Najang waterfall approx 100 feet high. Lastly you will trek a downhill step to Malpa. You can book yourself in one of the resorts in Malpa. Dinner and overnight stay at the resort. Begin your day with extra excited mood. From Malpa we will take you once more the steep climb. On your way you will come across very mesmerizing waterfalls that will enchant your hearts. You need to be careful as the path gets quite slippery. On the way you can halt at Lamare, where you can get a cup of tea to refresh yourself. After a steep descent walk you will lastly reach the village Budhi. On arrival, check into the hotel. Overnight stay at the hotel. After a healthy breakfast, we take you Chhiyalekh whish is a 3 Kms steep climb. Once you reach the spot you will forget about the tiring trip as the good-looking landscape will mesmerize you. The meadows, verdant greenery, pretty yellow and mauve flowers and a little temple in the middle are sure to blow your minds off. From here you can have a glimpse of the Mount Annapurna and other peaks and glaciers around. From here we let you trek Garbyang (3225 m). On your way you will be amazed by the towering, spiraling trees. You can also vision River Tinker that flows from Tibet which merges with the Kali at this point. Lastly you reach the other side of the river, Gunji. It is positioned at the confluence of rivers Kali and Kutti. On entrance, check in to the hotel. Dinner and overnight stay at the hotel. After an energetic breakfast you can walk along the banks of the roundabout river Kuti. Get puzzled by the snow clad peaks and the Bhojpatra forests. 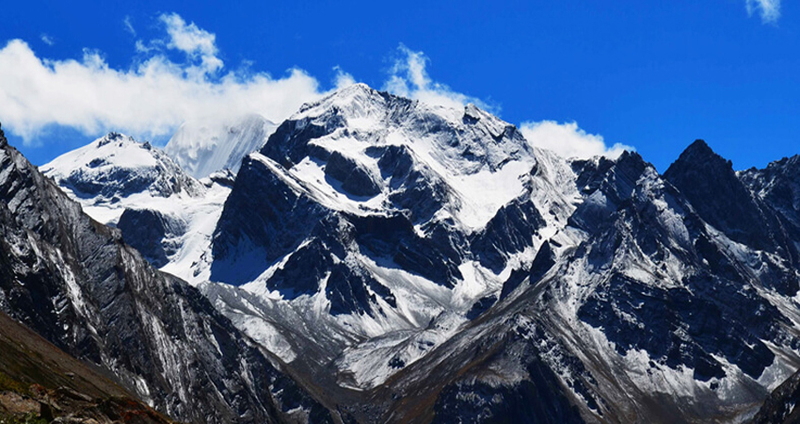 You can also get pleasure from the impressive view of the Apiand Nampha peaks. On your way you reach Nabi, which has a wonderful temple. You will find that in many places the river Kuti is completely covered with snow. We then take you to the Public Works Department hut at Nampha from where you can get a magnificent view. Kutti is the last village on your trek. Enjoy the heritage and traditions of the people of this village. On entrance, check in to the hotel. Dinner and overnight stay at Kutti. Begin your day again with an energetic breakfast. Post breakfast you may begin your trek. To Zolingkong. You will find that the river Kutti and its bridges are under a thick cover of snow. On your way you will find snow capped mountain ranges on all sides and strong winds. You will also come across the Indo-Tibet Border Police Force (ITBP) post at Zolinkong, which is open for a small part of the year. The wonderfully crafted snow capped Mount Adi Kailash looks like true paradise. On your opposite you will find Parvati's mukut (throne). At the foot of Mount Adi Kailash is the Gauri Kund whose waters reflect the mountain. Closely is the good-looking Parvati sarovar . You may visit the temples built on the bank of the river. Lastly you reach Zolingkong. Check in the hotel and overnight stay at the hotel. 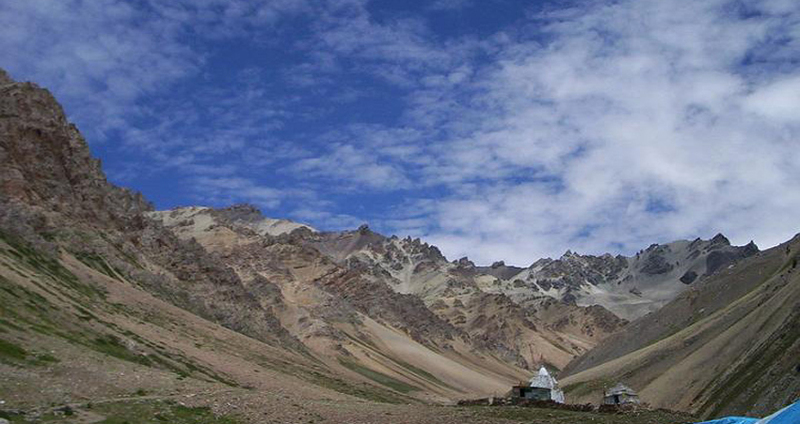 Get pleasure from your final part of your trek to reach Adi Kailash. In the twilight retreat back to Zolingkong. Dinner and overnight stay at the hotel in Zolingkong. Follow the similar way to reach to Kausani. On your entrance at Kasani, check into the hotel. Dinner and overnight stay at the hotel. Follow the same route to arrive to Kausani. On your arrival at Kasani, check into the hotel. Dinner and overnight stay at the hotel. After a delicious breakfast you will either be driven or have to travel by train (the selection is yours) to Delhi. Overnight stay at the train. Here ends your Adi Kailash Yatra package. On arriving Delhi, we will take you to the airport. From here you can board the flight to your home destination. In time transfer to the airport to board flight back home. By Air : Nearest airport is Pantnagar Airport, around 205 km from Bageshwar. By Rail : Kathgodam railway station, 171 km from Bageshwar, is the nearest railway station. By Road : Bamsera is 25.8Km from Bageshwar and accessed through Almora-Bageshwar-Munsiyari road. From Bamsera, tourists reach Saung or Song village, which is the starting point for the trek.